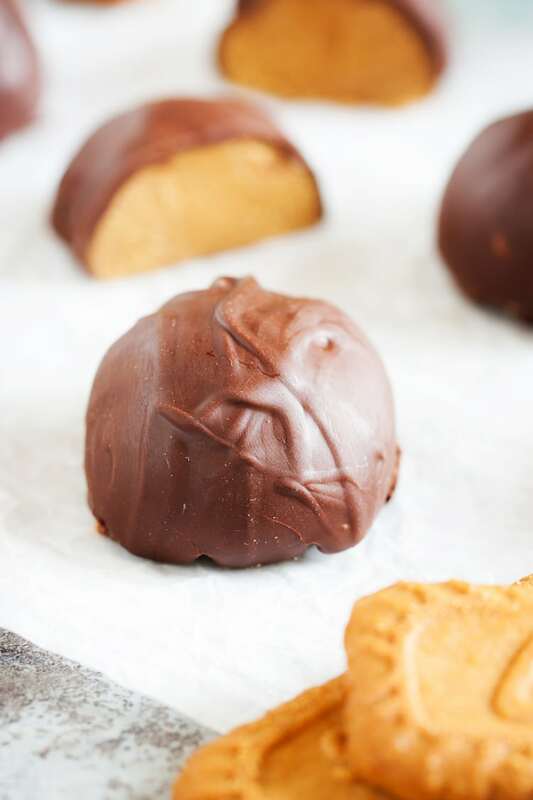 These Cookie Butter Balls are like classic peanut butter balls but made with cookie butter instead! An addition of graham crackers, sugar, and chocolate makes them a delicious holiday or everyday treat! 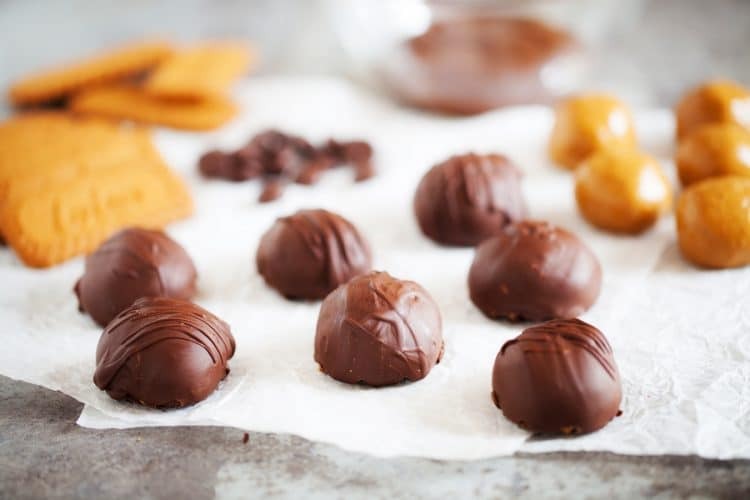 These Cookie Butter Balls will be an instant hit! I know, I know… I have a serious cookie butter problem… a problem that looks like a jar a week. Good God, what is wrong with me? Matt told me I needed to stop using cookie butter for everything, but when that’s what’s requested, what’s a girl to do? I’m not sure why he complains, he loves the stuff, maybe he likes it too much, and he can feel the diabetes addiction setting in. Anyways, this year is the first year we won’t be spending Christmas with Matt’s family as they’re in Florida celebrating with his grandparents. I knew Matt was kind of bummed about not having them here and having to wait a few extra days for his mother’s traditional treats. 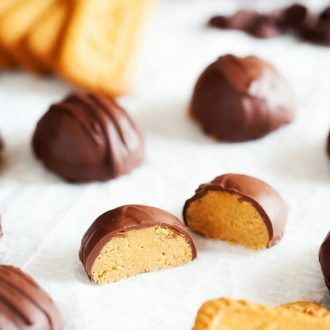 He claims that her peanut butter balls are the best, they taste more like a Reese’s cup than any other he’s ever had. Apparently, it’s the graham cracker she puts in them makes all the difference. I decided to try and make something similar for him to make their absence not as hard, of course, I can’t compete with Mom’s Peanut Butter Balls, but I can make Becca’s Cookie Butter Balls! I used the base of her recipe but switched the peanut butter with Speculoos crunchy cookie butter. I mean what’s better than cookie butter swirled up with confectioners’ sugar and graham crackers and then dipped in decadent dark chocolate? Having a hard time coming up with something, aren’t you? Matt even added a little sea salt to some for added goodness! Well there you have it, an easy and delicious sweet treat to make a package up for your loved ones! These would make great little gifts for co-workers, the mailman, and neighbors. 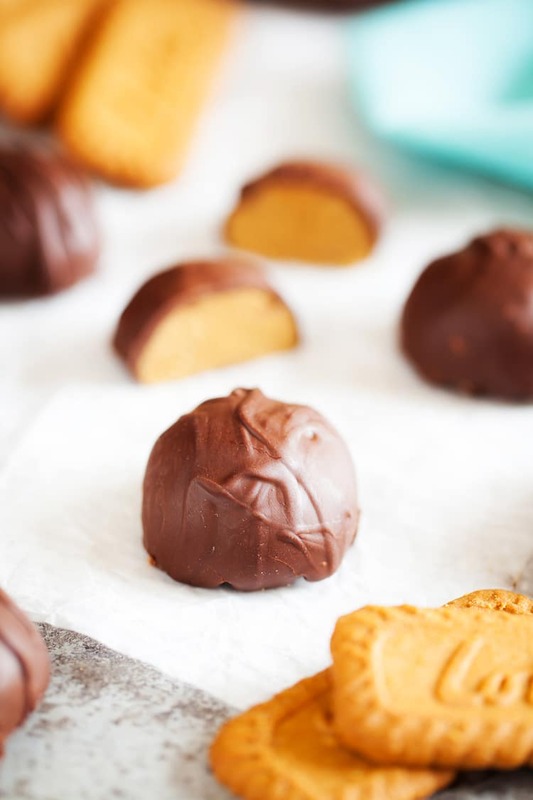 Made with Trader Joe's Cookie Butter these are a new twist on the traditional peanut butter ball! 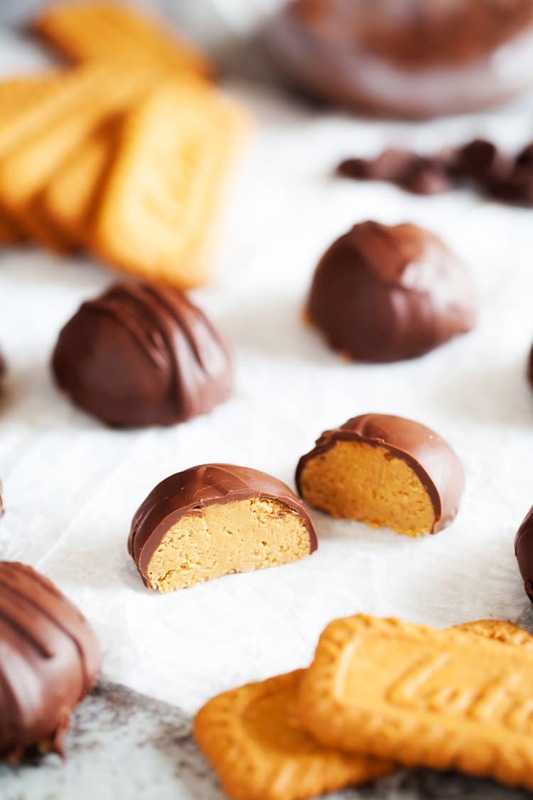 Combine cookie butter, graham crackers, and confectioners' sugar and mix until combined, you can add a little more cookie butter if needed. If balls are soft, you can chill them for about 10 minutes to make them easier to dip. Melt Dark chocolate wafers in a microwave safe bowl on 30 second intervals, stirring in between, until completely melted. Drizzle with any remaining chocolate. I love these!! Stumbled and pinned! Love you too, Nana! I hope you get a chance to make them, they’re quite good! I can always send you some too! Could you just swap peanut butter for the cookie butter and that’s his mom’s recipe?? I want to try both versions! 🙂 Thanks for making my holiday cookie platter a little more sweet! Such a great idea, why didn’t I think of that! Next time I’ll have to make them that way! I was just looking at this recipe and thought the same thing about subbing Biscoff cookies for the graham crackers! I have both the butter and cookies! Will try, today! I know, can’t believe I didn’t think of it! Hope you enjoy them!